When I was a child, I loved hard boiled eggs, so Mom packed them in my lunches every so often, securing salt for me in a twist of paper or in a folded slip. I can't remember how she did those clever little twists with waxed paper, but the slips I do remember how to fold. You may have seen needles in the same kinds of folded paper slips. 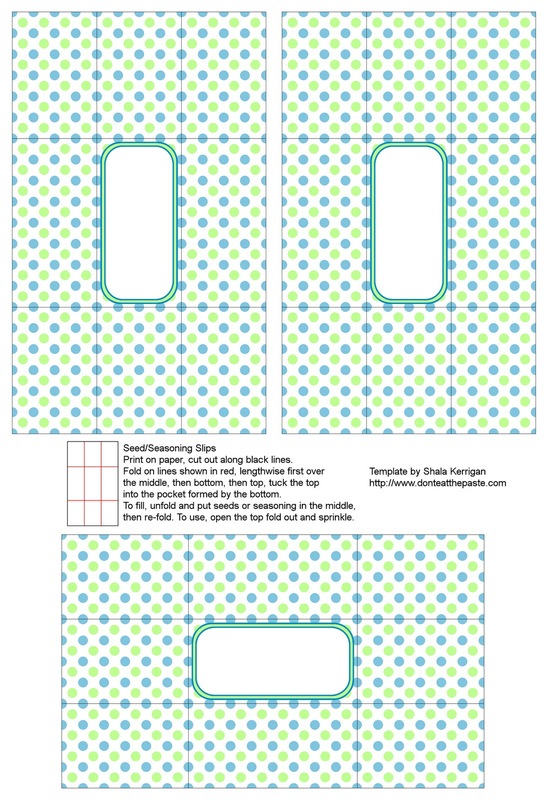 This card will hold 3 slips, and you can put seeds or seasoning into the slips. You can see the little teaspoon I used to fill mine with in that picture. 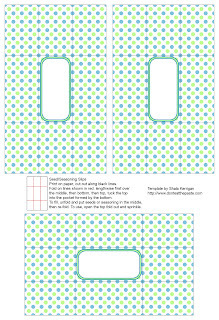 Print the slips on paper and the card on card stock. 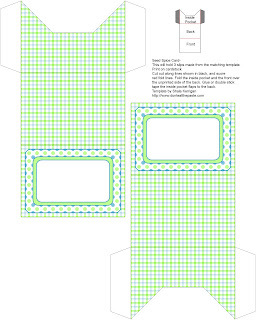 If you use a thin paper, you can fold them just as they are, if you use plain printer paper like I did, you may want to trim a bit off each long side before folding. Fold all the folds, then unfold and put the seasoning in the middle. Refold, tucking the top into the pocket formed by the bottom. 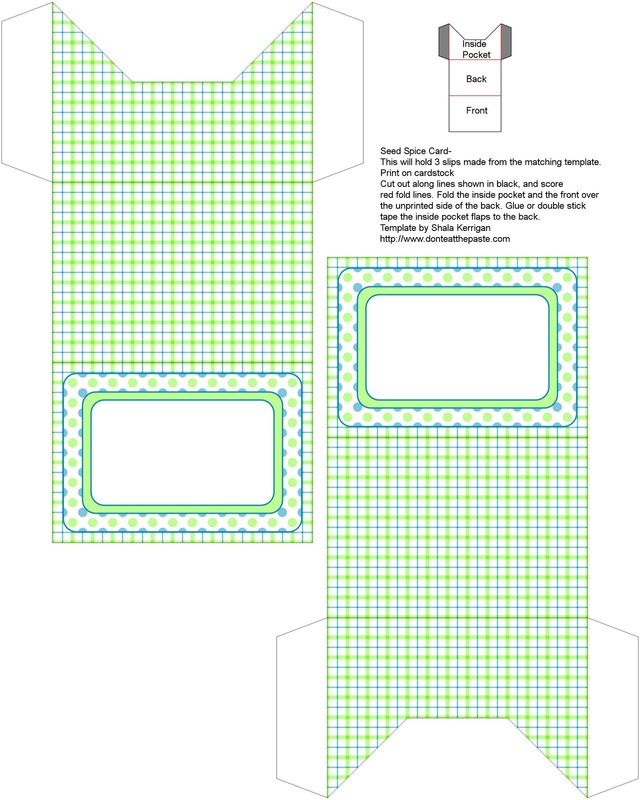 There are instructions on the template for folding. Because all the corners are folded, this packet doesn't leak easily, which makes it great for small seeds or for seasoning. The printable is both blank and marked for seasoning. 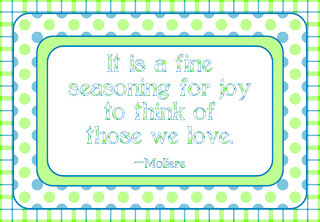 Note on mixed seasoning- I keep a big jar of pre-mixed seasoning on hand for quick meals. It's the mix my family likes, low in salt, with onions, garlic, pepper, a bit of cayenne and various other things. 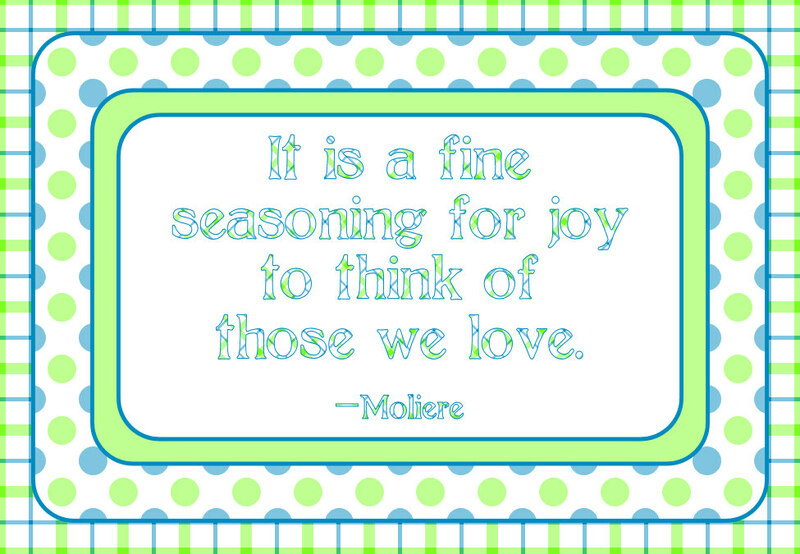 If you find you use the same seasonings for a lot of things, it's so convenient just to have a big jar pre-mixed and ready for use! 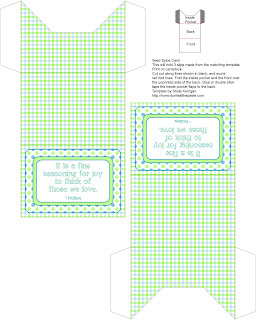 Click on the images for the full sized versions. Don't forget to score folds on the card before folding and gluing. I used a bit of string to tie the card shut. 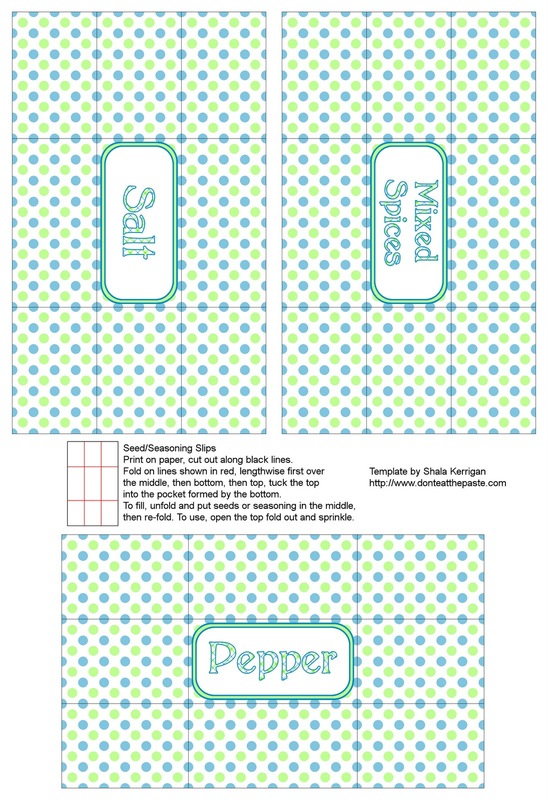 This card makes a nice way to share seeds, or a way to pack seasonings in a lunch or for picnics. The fills I made and used for this are at the bottom of the post. 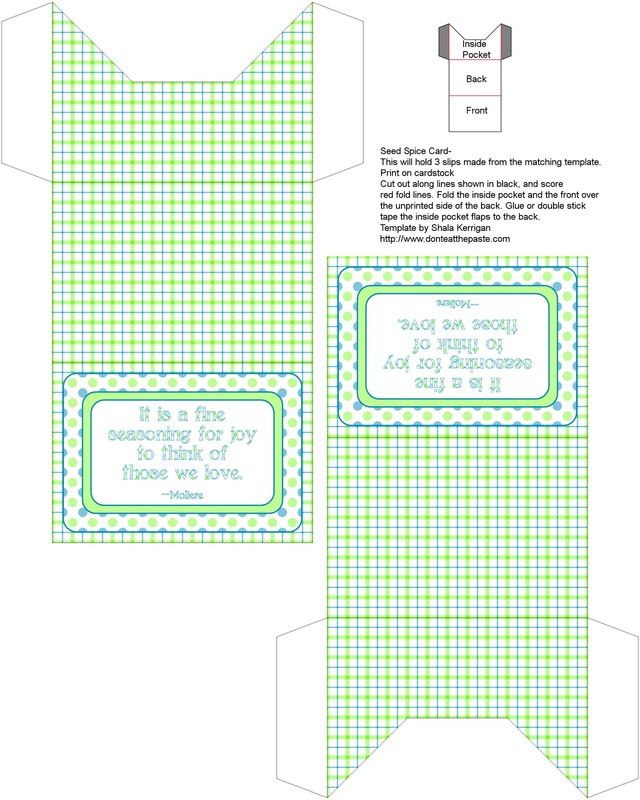 Recently I listed two new bead patterns in my Etsy store. What a great idea - love the story about your Mom sending salt along for your eggs. Thank you!